A lot of couples today are having engagement shoots done, not to mention the all-important wedding photographs. Some people even take advantage of an anniversary to have photographs taken. But it is sometimes really special to have professional photographs taken “just because”. This was the case for Annie and her husband on a recent trip to Paris, France. Paris has been the icon of romance for, well, forever! It is home to the Eiffel Tower, Champs-Élysées, grand palaces, Michelin starred restaurants and stunning churches, not to mention its many world-class museums, art galleries, and exquisite gardens. One is hard pressed not to find something to love about Paris. And so it was this quintessential Paris that Annie wanted to capture as part of her photo shoot, which she did with the help of a professional photographer in Paris named Daniel. Just Because We’re Married Doesn’t Mean We Can’t Have Fun! Daniel beautifully captured Annie and her husband enjoying their day in Paris, showing their happy, loving sides, with these photographs in arguably the most romantic city in the world. 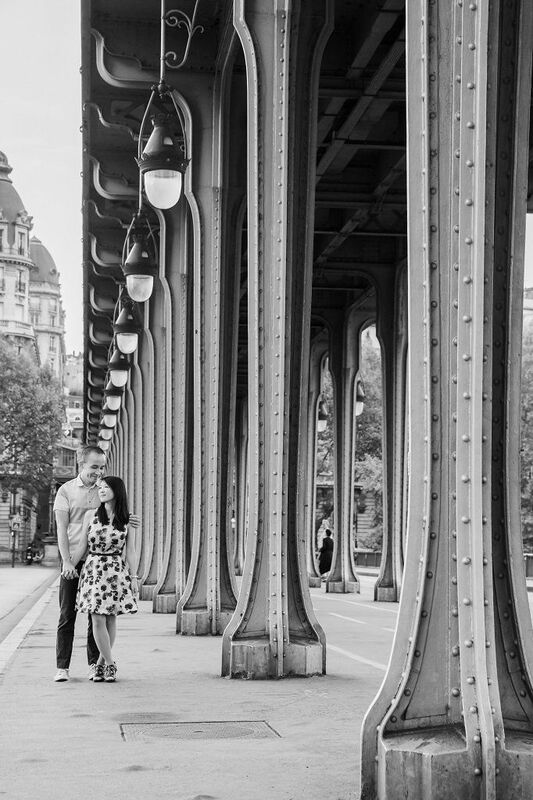 The couple is seen walking hand-in-hand across a bridge, with the iconic Eiffel Tower behind them, as well as other typical Parisian architecture, including the gorgeous Art Deco Bir-Hakeim bridge. Daniel captured the happily married couple at their best. They were obviously eager to enjoy this holiday together in Paris. Even though it was overcast, this lends the perfect lighting to the images, and Daniel took full advantage of the natural light to avoid significant shadows, which would have marred the images. As a result, the images are soft and warm, which is the perfect juxtaposition against the metal and stone of Paris. Daniel took photographs from a few different vantage points in the area, including both close-up and distance shots, and from different angles, ensuring that Annie and her husband will have the very best pictures to remind them of their special time together. The images are not overly posed, either. Instead, Annie and her husband were free to just be themselves, and be natural, as if the photographer was not there at all. They are simply allowed to be together, sharing their affection for one another, and enjoying their in Paris. Professional vacation photographers like Daniel can suggest the best locations for a variety of photo shoots, as they are often local experts. Their aim it to give their clients the ultimate photo shoot experience, and memories to treasure. Annie and her husband can cherish their time in France with these beautiful photographs, which they can share with their friends and the rest of their family. You don’t have to be a newlywed to have the time of your lives together; a professional photographer can capture a couple’s love, regardless of their years together.